Marshall County may be the smallest county in Oklahoma, but it is filled with numerous attractions available year round for the whole family. Marshall County is conveniently located two hours from both Dallas/Ft. Worth and Oklahoma City; and 30 miles from both Durant, OK to the east and Ardmore, OK to the west. Lake Texoma offers every kind of water entertainment and outdoor recreational activities, including: year round fishing/boating, swimming, skiing, wakeboarding, marinas, and camp grounds. Bird watching and hunting are other activities available. 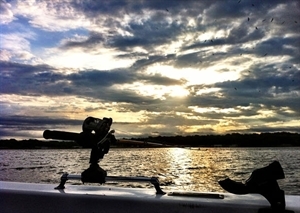 Lake Texoma has something for everyone in every season! Golfers are in luck with two excellent courses to use in Marshall County. The championship Chickasaw Pointe Golf Resort, on US 70, has a world-class layout of nearly 7,000 yards of scenic rolling hills, picturesque lake views, and super-smooth bent-grass greens. The Buncombe Creek Golf Course, located in a beautiful rural area, offers an ever-changing course to meet the levels of performance of any golfer. Marshall County supports civic and cultural interests with the Madill Art Club & the Genealogical & Historical Society and Museum. The Madill Art Club meets monthly with artists sharing painting tips and techniques. The annual Madill Art Show, held in October in the Madill Community Center in City Park, features amateur and professional artists from Southern Oklahoma and North Texas competing for prize money and ribbons. The show features several hundred entries of original oils, watercolors, mixed media, pottery, sculpture and junior division entries. The Museum of Southern Oklahoma began preserving yesterday for Marshall County in 1975. Since then, it has continued to bring together and assist those interested in the discovery and collection of the history and genealogy of Marshall County. Also available is specialized family and genealogical research. Marshall County offers a variety of shopping. From specialty stores, boutiques, clothing stores, department stores, antique shops, to crafts and collectibles, there is something for everyone! Shop Marshall County held annually in November and December, encourages shoppers to shop in Marshall County. Winners receive Chamber Bucks to make additional purchases with the Shop Marshall County merchants. Marshall County is home to the National Sand Bass Festival - Madill's "Jumpin' Little Summer Fest", which is held the first full week in June, and attracts 30,000 people each year from all across the United States. Held on Madill's town square, the festival features a carnival, an arts and crafts fair, food booths and an entertainment slate. Annual events also include the King Sandie Fun Run, King Sandie Fishing Tournament, and the 3-on-3 Basketball Tournament. There are also terrapin races, a car show, talent search, and games and competitions for children. Free Nightly Concerts featuring local bands, gospel singing, talent search winners, and well known Nashville Recording Artists. Marshall County is also home to 2 big rodeo events each year. The Madill FFA Rodeo occurs in April and is the oldest rodeo in Oklahoma. July brings the 66th annual Madill Round Up Club Rodeo. Each showcases rodeo competitors and have earned state and national recognitions. The Reuel Little Classic is an annual 5K, 10K and a half-marathon run which honors long-time attorney and political figure Reuel W. Little and is quickly becoming one of the best organized, best attended runs in the state. The run takes place every October in Madill. Marshall County supports civic and cultural interests with the Madill Art Club & the Genealogical & Historical Society and Museum. The Madill Art Club meets monthly with artists sharing painting tips and techniques. The annual Madill Art Show, held in October in the Madill Community Center in City Park, features amateur and professional artists from Southern Oklahoma and North Texas competing for prize money and ribbons. The show features several hundred entries of original oils, watercolors, mixed media, pottery, sculpture and junior division entries. The Museum of Southern Oklahoma began preserving yesterday for Marshall County in 1975. Since then, it has continued to bring together and assist those interested in the discovery and collection of the history and genealogy of Marshall County. Also available is specialized family and genealogical research. J.A.M.M Transit is the public transportation provider for Marshall County. J.A.M.M. Transit’s goal is to provide the best possible transportation service to its residents. Buses and vans are lift or ramp-equipped so they are accessible for people who use a mobility device or cannot climb steps. Drivers receive special training in assisting people with disabilities. Cost is only $1/trip. Jan 29.0 F° 40.5 F° 52.0 F° 2.2 "
Feb 34.0 F° 45.5 F° 57.0 F° 2.6 "
Mar 41.0 F° 53.0 F° 65.0 F° 3.5 "
Apr 50.0 F° 62.0 F° 74.0 F° 3.7 "
May 61.0 F° 71.5 F° 82.0 F° 5.3 "
Jun 68.0 F° 78.5 F° 89.0 F° 5.0 "
Jul 73.0 F° 84.0 F° 95.0 F° 2.6 "
Aug 72.0 F° 83.5 F° 95.0 F° 2.4 "
Sep 63.0 F° 75.0 F° 87.0 F° 4.0 "
Oct 52.0 F° 64.0 F° 76.0 F° 4.5 "
Nov 41.0 F° 53.0 F° 65.0 F° 3.0 "
Dec 32.0 F° 43.0 F° 54.0 F° 2.7 "
Spring temperatures are cool with averages in the low 60's and highs in the low 70's. Nights are cool with lows in the low 50's. Summer temperatures are warm with averages in the low 80's and highs in the low 90's. Nights are mild with lows in the low 70's. Fall temperatures are cool with averages in the low 60's and highs in the mid 70's. Nights are cool with lows in the low 50's. Winter temperatures are cold with averages in the low 40's and highs in the mid 50's. Nights are cold with lows in the low 30's.